Thinking comes naturally. You don’t have to make it happen—it just does. But you can make it happen in different ways. For example, you can think positively or negatively. You can think with “heart” and you can think with rational judgment. You can also think strategically and analytically, and mathematically and scientifically. These are a few of multiple ways in which the mind can process thought. What are some forms of thinking you use? When do you use them, and why? As a college student, you are tasked with engaging and expanding your thinking skills. One of the most important of these skills is critical thinking. Critical thinking is important because it relates to nearly all tasks, situations, topics, careers, environments, challenges, and opportunities. It’s a “domain-general” thinking skill—not a thinking skill that’s reserved for a one subject alone or restricted to a particular subject area. Great leaders have highly attuned critical thinking skills, and you can, too. In fact, you probably have a lot of these skills already. Of all your thinking skills, critical thinking may have the greatest value. Critical thinking is clear, reasonable, reflective thinking focused on deciding what to believe or do. It means asking probing questions like, “How do we know?” or “Is this true in every case or just in this instance?” It involves being skeptical and challenging assumptions, rather than simply memorizing facts or blindly accepting what you hear or read. 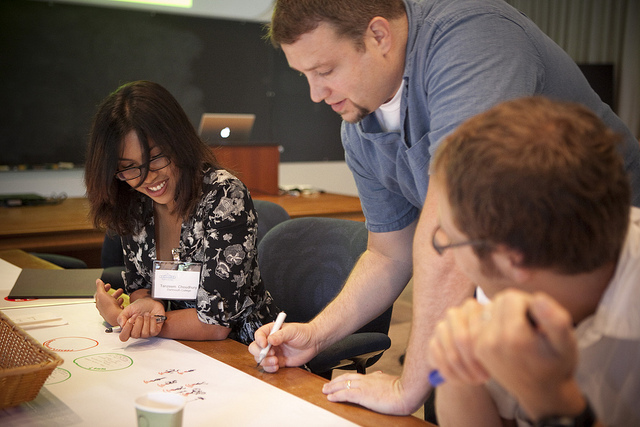 Who are critical thinkers, and what characteristics do they have in common? Critical thinkers are usually curious and reflective people. They like to explore and probe new areas and seek knowledge, clarification, and new solutions. They ask pertinent questions, evaluate statements and arguments, and they distinguish between facts and opinion. They are also willing to examine their own beliefs, possessing a manner of humility that allows them to admit lack of knowledge or understanding when needed. They are open to changing their mind. Perhaps most of all, they actively enjoy learning, and seeking new knowledge is a lifelong pursuit. No matter where you are on the road to being a critical thinker, you can always more fully develop and finely tune your skills. Doing so will help you develop more balanced arguments, express yourself clearly, read critically, and glean important information efficiently. Critical thinking skills will help you in any profession or any circumstance of life, from science to art to business to teaching. With critical thinking, you become a clearer thinker and problem solver. The following video, from Lawrence Bland, presents the major concepts and benefits of critical thinking. 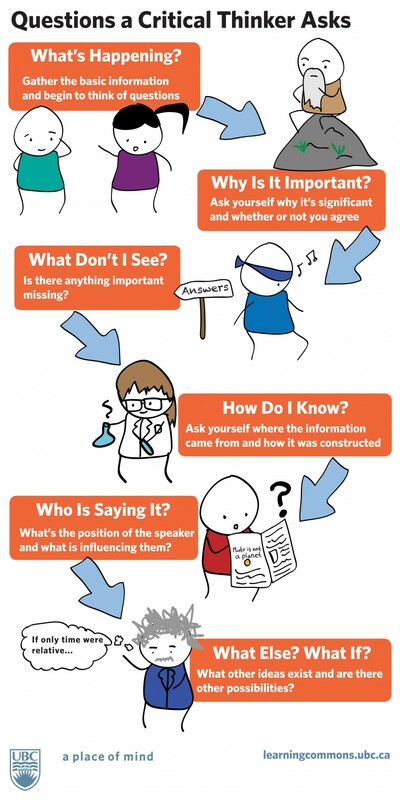 Assess your basic understanding of the skills involved in critical thinking. Visit the Quia Critical Thinking Quiz page and click on Start Now (you don’t need to enter your name). Select the best answer for each question, and then click on Submit Answers. A score of 70 percent or better on this quiz is considering passing. Based on the content of the questions, do you feel you use good critical thinking strategies in college? In what ways might you improve as a critical thinker? Critical thinking is fundamentally a process of questioning information and data. You may question the information you read in a textbook, or you may question what a politician or a professor or a classmate says. You can also question a commonly-held belief or a new idea. With critical thinking, anything and everything is subject to question and examination for the purpose of logically constructing reasoned perspectives. What Is Logic, and Why Is It Important in Critical Thinking? The word logic comes from the Ancient Greek logike, referring to the science or art of reasoning. Using logic, a person evaluates arguments and reasoning and strives to distinguish between good and bad reasoning, or between truth and falsehood. Using logic, you can evaluate ideas or claims people make, make good decisions, and form sound beliefs about the world. Let’s use a simple example of applying logic to a critical-thinking situation. In this hypothetical scenario, a man has a PhD in political science, and he works as a professor at a local college. His wife works at the college, too. They have three young children in the local school system, and their family is well known in the community. The man is now running for political office. Are his credentials and experience sufficient for entering public office? Will he be effective in the political office? Some voters might believe that his personal life and current job, on the surface, suggest he will do well in the position, and they will vote for him. In truth, the characteristics described don’t guarantee that the man will do a good job. The information is somewhat irrelevant. What else might you want to know? How about whether the man had already held a political office and done a good job? In this case, we want to ask, How much information is adequate in order to make a decision based on logic instead of assumptions? What’s happening? Gather the basic information and begin to think of questions. Why is it important? Ask yourself why it’s significant and whether or not you agree. What don’t I see? Is there anything important missing? How do I know? Ask yourself where the information came from and how it was constructed. Who is saying it? What’s the position of the speaker and what is influencing them? What else? What if? What other ideas exist and are there other possibilities? Your roommate was upset and said some unkind words to you, which put a crimp in the relationship. You try to see through the angry behaviors to determine how you might best support the roommate and help bring the relationship back to a comfortable spot. Your campus club has been languishing on account of lack of participation and funds. The new club president, though, is a marketing major and has identified some strategies to interest students in joining and supporting the club. Implementation is forthcoming. Your final art class project challenges you to conceptualize form in new ways. On the last day of class when students present their projects, you describe the techniques you used to fulfill the assignment. You explain why and how you selected that approach. Your math teacher sees that the class is not quite grasping a concept. She uses clever questioning to dispel anxiety and guide you to new understanding of the concept. You have a job interview for a position that you feel you are only partially qualified for, although you really want the job and you are excited about the prospects. You analyze how you will explain your skills and experiences in a way to show that you are a good match for the prospective employer. You are doing well in college, and most of your college and living expenses are covered. But there are some gaps between what you want and what you feel you can afford. You analyze your income, savings, and budget to better calculate what you will need to stay in college and maintain your desired level of spending. Problem-solving can be an efficient and rewarding process, especially if you are organized and mindful of critical steps and strategies. Remember, too, to assume the attributes of a good critical thinker. If you are curious, reflective, knowledge-seeking, open to change, probing, organized, and ethical, your challenge or problem will be less of a hurdle, and you’ll be in a good position to find intelligent solutions. When you read and take notes, use the text coding strategy. Text coding is a way of tracking your thinking while reading. It entails marking the text and recording what you are thinking either in the margins or perhaps on Post-it notes. As you make connections and ask questions in response to what you read, you monitor your comprehension and enhance your long-term understanding of the material. With text coding, mark important arguments and key facts. Indicate where you agree and disagree or have further questions. You don’t necessarily need to read every word, but make sure you understand the concepts or the intentions behind what is written. Feel free to develop your own shorthand style when reading or taking notes. The following are a few options to consider using while coding text. See more text coding from PBWorks and Collaborative for Teaching and Learning. When you examine arguments or claims that an author, speaker, or other source is making, your goal is to identify and examine the hard facts. You can use the spectrum of authority strategy for this purpose. The spectrum of authority strategy assists you in identifying the “hot” end of an argument—feelings, beliefs, cultural influences, and societal influences—and the “cold” end of an argument—scientific influences. The following video explains this strategy. When you use critical thinking to evaluate information, you need to clarify your thinking to yourself and likely to others. Doing this well is mainly a process of asking and answering probing questions, such as the logic questions discussed earlier. Design your questions to fit your needs, but be sure to cover adequate ground. What is the purpose? What question are we trying to answer? What point of view is being expressed? What assumptions are we or others making? What are the facts and data we know, and how do we know them? What are the concepts we’re working with? What are the conclusions, and do they make sense? What are the implications? “Habits of mind” are the personal commitments, values, and standards you have about the principle of good thinking. Consider your intellectual commitments, values, and standards. Do you approach problems with an open mind, a respect for truth, and an inquiring attitude? Some good habits to have when thinking critically are being receptive to having your opinions changed, having respect for others, being independent and not accepting something is true until you’ve had the time to examine the available evidence, being fair-minded, having respect for a reason, having an inquiring mind, not making assumptions, and always, especially, questioning your own conclusions—in other words, developing an intellectual work ethic. Try to work these qualities into your daily life. Reflect and practice: Always reflect on what you’ve learned. Is it true all the time? How did you arrive at your conclusions? Use wasted time: It’s certainly important to make time for relaxing, but if you find you are indulging in too much of a good thing, think about using your time more constructively. Determine when you do your best thinking and try to learn something new during that part of the day. Redefine the way you see things: It can be very uninteresting to always think the same way. Challenge yourself to see familiar things in new ways. Put yourself in someone else’s shoes and consider things from a different angle or perspective. If you’re trying to solve a problem, list all your concerns: what you need in order to solve it, who can help, what some possible barriers might be, etc. It’s often possible to reframe a problem as an opportunity. Try to find a solution where there seems to be none. Analyze the influences on your thinking and in your life: Why do you think or feel the way you do? Analyze your influences. Think about who in your life influences you. Do you feel or react a certain way because of social convention, or because you believe it is what is expected of you? Try to break out of any molds that may be constricting you. Express yourself: Critical thinking also involves being able to express yourself clearly. Most important in expressing yourself clearly is stating one point at a time. You might be inclined to argue every thought, but you might have greater impact if you focus just on your main arguments. This will help others to follow your thinking clearly. For more abstract ideas, assume that your audience may not understand. Provide examples, analogies, or metaphors where you can. Enhance your wellness: It’s easier to think critically when you take care of your mental and physical health. Try taking 10-minute activity breaks to reach 30 to 60 minutes of physical activity each day. Try taking a break between classes and walk to the coffee shop that’s farthest away. Scheduling physical activity into your day can help lower stress and increase mental alertness. Also, do your most difficult work when you have the most energy. Think about the time of day you are most effective and have the most energy. Plan to do your most difficult work during these times. And be sure to reach out for help. If you feel you need assistance with your mental or physical health, talk to a counselor or visit a doctor. Think about someone you consider to be a critical thinker (friend, professor, historical figure, etc). What qualities does he/she have? 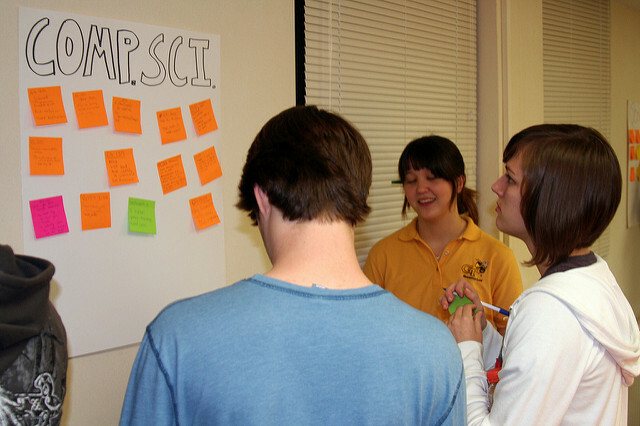 Review some of the critical thinking strategies discussed on this page. Pick one strategy that makes sense to you. How can you apply this critical thinking technique to your academic work? Habits of mind are attitudes and beliefs that influence how you approach the world (i.e., inquiring attitude, open mind, respect for truth, etc). What is one habit of mind you would like to actively develop over the next year? How will you develop a daily practice to cultivate this habit? Write your responses in journal form, and submit according to your instructor’s guidelines. The following text is an excerpt from an essay by Dr. Andrew Robert Baker, “Thinking Critically and Creatively.” In these paragraphs, Dr. Baker underscores the importance of critical thinking—the imperative of critical thinking, really—to improving as students, teachers, and researchers. The follow-up portion of this essay appears in the Creative Thinking section of this course. Critical thinking skills are perhaps the most fundamental skills involved in making judgments and solving problems. You use them every day, and you can continue improving them. The academic setting demands more of us in terms of critical thinking than everyday life. It demands that we evaluate information and analyze myriad issues. It is the environment where our critical thinking skills can be the difference between success and failure. In this environment we must consider information in an analytical, critical manner. We must ask questions—What is the source of this information? Is this source an expert one and what makes it so? Are there multiple perspectives to consider on an issue? Do multiple sources agree or disagree on an issue? Does quality research substantiate information or opinion? Do I have any personal biases that may affect my consideration of this information? It is only through purposeful, frequent, intentional questioning such as this that we can sharpen our critical thinking skills and improve as students, learners and researchers.